We heard from one of our Atlas Line users today about how much the Atlas Line has been “on fire” the last few months, producing profitable trades nearly every day. This emini trading chart shows how 1.5 points were possible today. The Atlas Line saw how price was going to climb and produced a Double Bar Long signal. Using the ATR, we knew to get out of the trade, allowing for the 1.5 points. 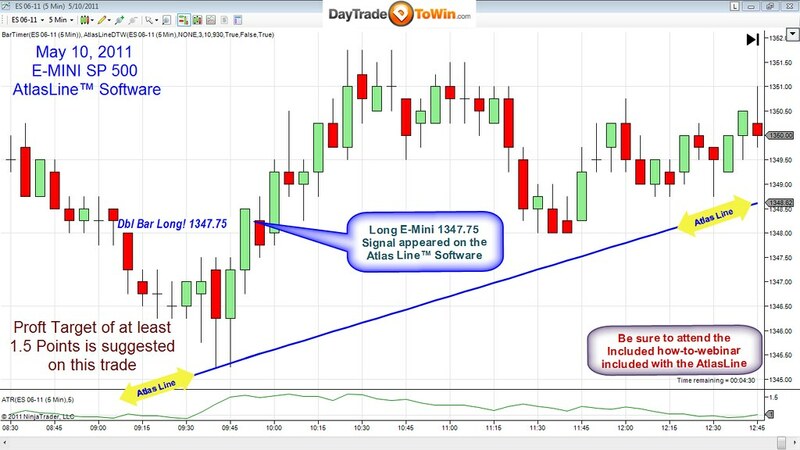 Using the ATR is covered in the online day trading course / how-to-webinar that comes with purchase of the Atlas Line. Traders who were not using the Atlas Line probably went short soon after market open, resulting in loss. 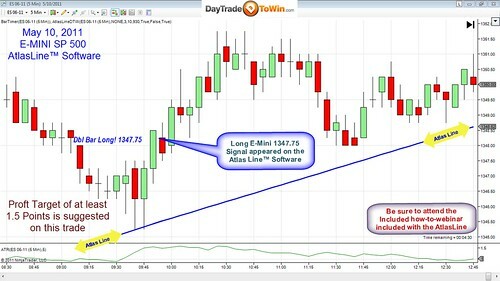 The Atlas Line makes futures trading very easy. I see you have different scalping methods ie price action scalping and tradescalper and atlas line. Which is most recommended for E-mini trading? futures trading at its best, bravo guys! Hey JP, Barry here thanks for sitting with me last week… loving how consistent and easy futures trading can be!